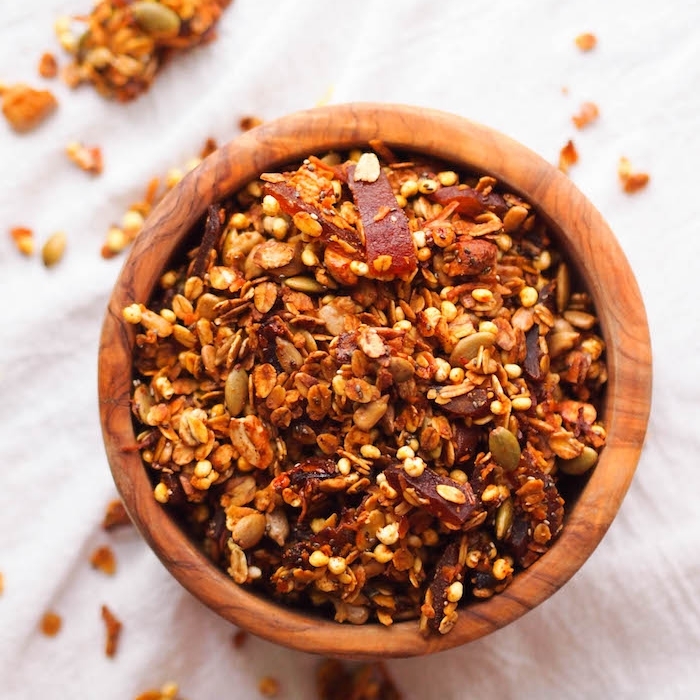 There are certain flavor combinations that just get me every time, and sweet and spicy is one of them, especially when there's a burst of freshness. I think that's why I fell so in love with Vietnamese food when we traveled there a few years ago. They hit that perfect blend of sweet and spicy along with tons of herbs to brighten it up. 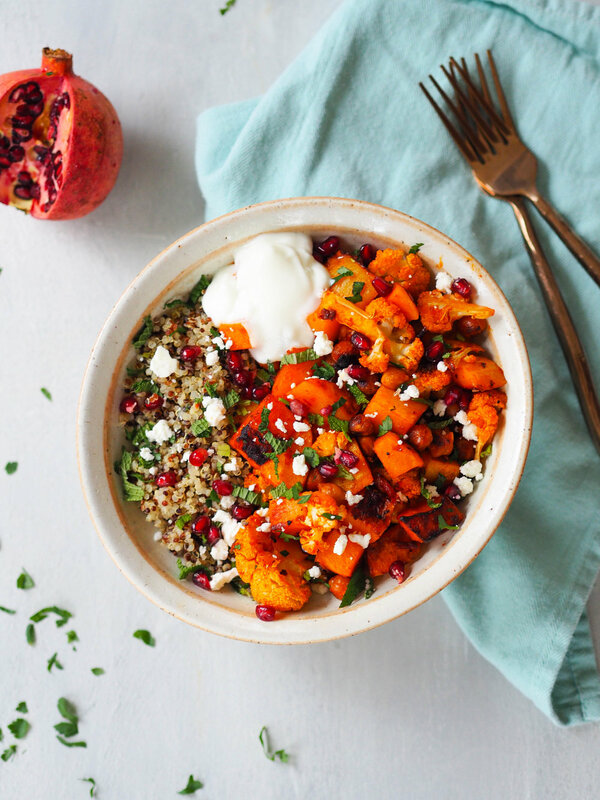 This harissa roasted butternut, cauliflower and chickpea bowl has that same flavor combo I love, with a glaze of harissa paste and pure maple syrup over roasted fall vegetables, and a garnish of juicy tart pomegranate seeds, mint and cilantro to freshen it up. With the added sugar from the maple syrup, the vegetables get extra caramelized and delicious, and the chickpeas take on a slightly crunchy glaze. I love this recipe because it's actually pretty easy to throw together, especially if you have precooked quinoa (or rice) on hand. The vegetables and chickpeas get roasted in the same pan, so it's almost a sheet-pan meal. It's perfect for batch cooking for a grab and go lunch during the week. If you've never used harissa before, it's a North African condiment made with roasted hot chiles, olive oil, garlic, and spices. Heat and acidity can vary quite a bit from brand to brand, and personally, I prefer ones that are more smoky than tart, and moderately spicy. This brand of harissa by DEA is my favorite, but I can't find it anywhere near me. I also really like Trader Joe's new harissa paste, and it's not too spicy either. I love to use harissa as a condiment over scrambled eggs, mixed with Greek yogurt to make a spicy sauce for falafel, blended into a tomato based soup or sauce for spice, or swirled into hummus. Adapted from Healthy Nibbles and Bits. Bring 2 cups water and quinoa to a boil on medium-high heat. Cover, reduced heat, and simmer 15-20 minutes until water is absorbed. Let sit 5 minutes to finish steaming, then fluff with a fork. In a medium bowl, whisk together harissa, olive oil and maple syrup. In a large bowl, toss together cauliflower, squash and chickpeas. Spread evenly on two large baking sheets. Divide harissa sauce between the two baking sheets and toss to combine. Season with salt and black pepper, place in the oven and roast 35-40 minutes until caramelized and tender. Serve roasted vegetables over a scoop of quinoa. Top with crumbled feta, pomegranate, a scoop of yogurt, mint and parsley, then spritz with a bit of lemon juice before serving.